This propane fired furnace can smelt ore concentrates, fire assay, melt pure metals, old jewelry... it can do it all and in larger quantities. Quiet, too. 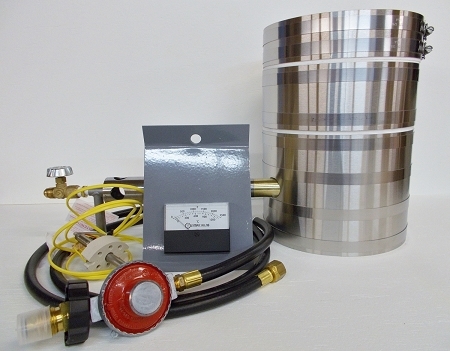 Included in your deluxe kit will be a custom USA built precision machined bi-metal brass tipped Propane Burner, 6' Hose with 60psi regulator, gauge and needle valve, Olympic Analog Pyrometer and liner maintenance kit. Accessories, such as tongs, flux, crucibles, pouring molds are available on this website - or - order the Deluxe KK-8 Kit (also on sale) that includes all you need to get started other than propane and your ore.